To provide training and tools to help parts sales people better manage their time and maximize sales while delivering an excellent customer experience. One day, (6 hour) program created specifically for dealership parts counter sales people. This program will benefit new and experienced parts sales people, parts managers and CSR’s that are on the front line of your dealership’s parts sales force. **Please note: If you are registering attendees for both Saskatoon and Regina, the total number qualifies for the group Quantity Discount. For example, if you register a total of 5 with 4 in Regina and 1 in Saskatoon please select the 5+ price, the same goes for an example of registering 6 in Saskatoon and 3 in Regina, please choose the 9+ price for both Saskatoon and Regina. If you have any questions please call us in Calgary at (800) 661-2452, thank you. Kelly has almost 30 years’ experience in the agricultural equipment industry. He started his career as a sales representative during the high interest crunch of the 1980’s He then spent 10 years in sales and marketing with the distributor and wholesale manufacturer, Flexi Coil, covering Canada, Australia and the U.S. In 1996 he became a partner in a single store John Deere Dealership in Brandon, Manitoba. Over the next 12 years, it grew from 1 store to 7 when they eventually merged with Enns Brothers in 2008. Over the years, he gained experience as a Sales Manager, Aftermarket Manager, General Manager and Group Marketing Manager. In 2011, Kelly sold his partnership interest and took a contract as Group Product Support Manager with Chesterfield Australia, one of the country’s largest John Deere Dealer groups. 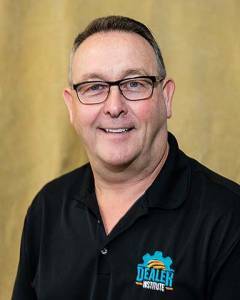 In 2014, Kelly launched a consulting and training company, Kayzen Management, and in 2015 joined Western Equipment Dealers Association’s Dealer Institute as a consultant and trainer. Kelly brings his unique, real life experience and time-tested best practice solutions to a wide scope of dealership issues. His philosophy of “continuous improvement” can be applied over all dealership departments. Dealer Institute provides solutions and resources for growing your business and people and improving operational and financial efficiencies. You now have expanded access to a variety of affordable training programs and consulting services that can be delivered in a way that works best for you.